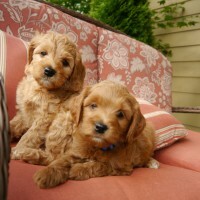 We’re an Oregon family breeder and we sell standard, mini and medium size genuine, multi-generational Australian Labradoodles in various colors. Our breeding dogs maintain high standards for health and genetics and we choose only the best studs for breeding only the best temperaments. Click the “Read More” tab to view some of our dogs and pups. We only have a few litters each year, and that makes each pup so special to us, each being individually loved and treated as our own before sending them to them forever families.